The proportion of women who stay childless has almost tripled in the past 20 years, with experts expecting the trend to continue as values and norms about having kids change. The Population Trends 2015 report, released by the Department of Statistics last month, highlighted the spike among ever-married female citizens and permanent residents (PRs) aged between 40 and 49 - the age group which is likely to have completed childbearing. The group totalled 267,628 in 2014. Last year, 11.2 per cent of these women had no children, up from 7.1 per cent in 2004 and 4.2 per cent in 1994. Ever-married refers to those who are currently married, divorced or widowed. Sociologists described the increase as significant and said it reflects changing values and norms. Professor Jean Yeung, director of the Centre for Family and Population Research at the National University of Singapore, said: "People think less of passing on their lineage and what their parents want... As people get better educated and cost of living and expectations of living standards rise, it's also more socially acceptable not to have children. 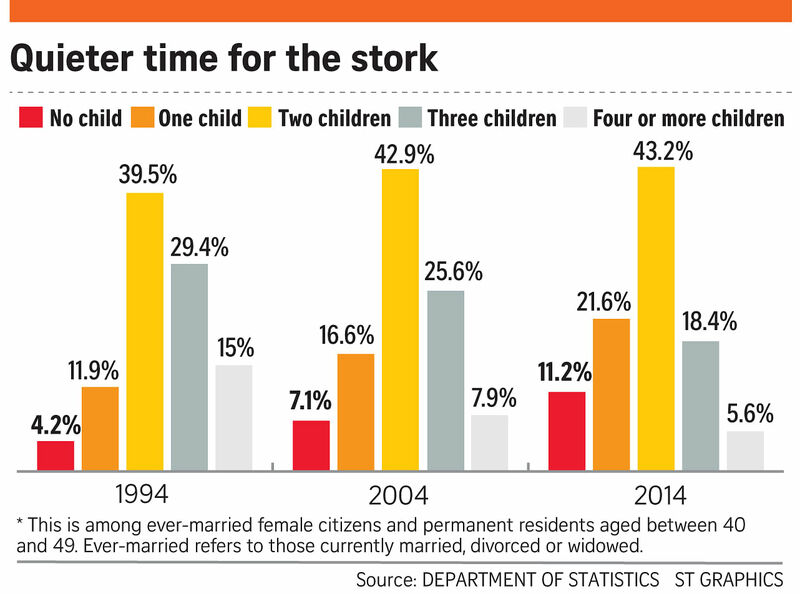 "It's the decoupling of marriage and children." Part of the reason for the jump is that some couples want children but cannot have them. For many, it is perhaps because they have put off childbearing for too long. Dr Peter Chew, a gynaecologist for more than 40 years, said he often sees women who are focused on establishing their careers and waited until it was too late to try for a baby. As a woman ages, the chances of her getting pregnant decline. Lawyer Gloria James-Civetta, 47, got hitched at 42. She suffered a miscarriage and, after that, she felt it was unsafe to try for a baby, as older mothers have a higher risk of having a pregnancy with complications. She and her Singapore PR husband Gustavo, 50, considered adopting a child, but dropped the idea. They run a law firm together. "It's not easy to raise a child properly at our age and it's too much of a demand on our time. It would be like caring for two sets of children - a kid and our elderly parents, who become like children in their old age. I think having a kid would be more stressful than running an office." Then, there are those who told The Sunday Times they chose not to have children. They say they enjoy the freedom of life without kids or just do not want to deal with the lifelong responsibility of raising a child. A qualitative study on childless Chinese Singaporean women, published in 2012, also shed some light. The lower-income women in the survey felt they could not afford to raise a child with an average monthly pay of $2,350. As for the university-educated women, with an average salary of $6,250 a month, they said they could not juggle motherhood and their work, and were unwilling to sacrifice their careers. Both groups of women were also loath to give up their time and freedom and felt their husbands would not do their fair share in raising junior. The study was done by sociology lecturer Caroline Pluss, from the University of Liverpool in Singapore, her former student, Ms Amanda Ee, and Hong Kong sociologist Chan Kwon Bun. The spike in the ranks of childless women comes as couples have fewer children. The average number of children born to ever-married female citizens and PRs in the 40 to 49 age group fell from 2.46 in 1994 to 1.87 last year. Sociologists said the growing number of childless couples is worrying, considering that more Singaporeans are staying single. And even for those who marry, fewer have children or decide to not have any at all, for various reasons. Add the fact that Singaporeans increasingly are marrying later, which affects their fertility, the situation could get even more severe. Dr Tan Poh Lin, assistant professor at the Lee Kuan Yew School of Public Policy, said: "It has become increasingly socially acceptable to be a childless married couple here, leading to a vicious circle of rising childlessness. "However, humans are programmed to desire to have children and there will always be a large proportion of the population who will continue to fulfil this desire."